Bonavista Villa is located in a gated community, and is just steps away from Gibbs Beach. It has a cook, a laundress, and a housekeeper to see to your every need. The pool is large enough for a serious workout, but the cushioned lounge chairs under the covered veranda are always available for long, lazy afternoons. End your days on the veranda, a glass of wine in hand as you watch the sunset over the water with someone special. 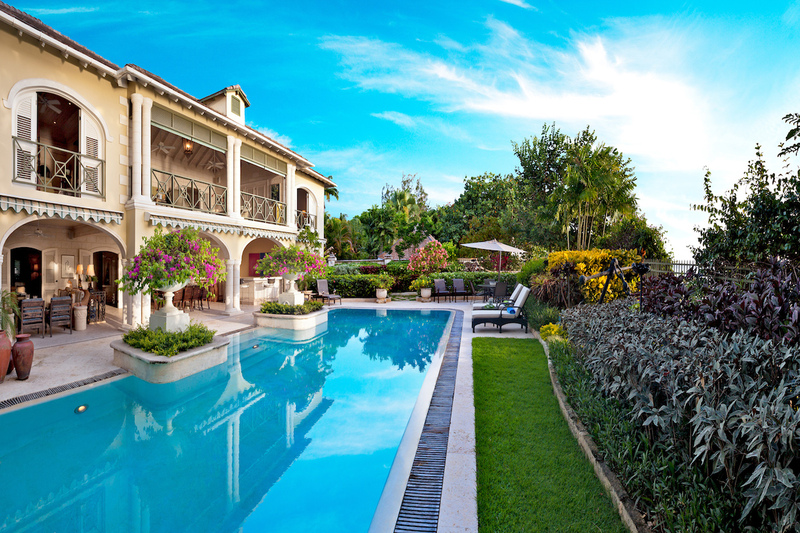 Bonavista Villa sits on a quiet stretch of white sand on the stunning West Coast of Barbados. A paved courtyard surrounded by lush Caribbean greenery leads to the villa, and the arched front door provides a window to the sea. Gibbs Bay is only a few steps from the villa’s tropical garden, but there is also an infinity-edge lap pool between the gardens and the covered terrace. The terrace is fully equipped for any time of day thanks to a full dining table, a barbecue grill, a recessed service counter, a living area, and a wet bar. The pool deck offers a shaded dining table and sunbathed loungers. Upstairs, there’s a balcony ideal for relaxing with a good book or watching the sunset. A Roman-style fountain is nestled into a small alcove in the drawing room, which is elegantly outfitted with mahogany furnishings, antique Oriental rugs, and polished antique mirrors. The living areas flow onto the covered terrace, and the central hallway is decorated with antique vases and stone turtle footstools. Cooks will love the gourmet kitchen, which is equipped with stainless steel appliances, a coffee machine, an electric kettle, and a bar. Upstairs, there’s a family room with Cable TV, a DVD player, surround sound, and a printer/scanner. There are four beautifully furnished bedrooms with air-conditioning and ensuite bathrooms. Two are upstairs, and two are downstairs. The upper level master suite has a king bed, a balcony, a study, and access to the outdoor living area. The other upper level suite has a king bed and a large armchair. Downstairs, both suites open to the garden and pool deck. One has a king bed and the other has two twins. Bonavista is staffed with a cook, housekeeper, and laundress. Bonavista is near shopping, golf, and a white, sandy beach. The villa is between Speightstown and Holetown, so guests can easily access a variety of restaurants and activities. Located on the beautiful Gibbs Beach. Excellent swimming. Some things never change: you are always guaranteed to have a great time in Barbados. This was a return visit to the island, but it was our first time at Bonavista. Architecturally, it was the finest villa we’ve stayed in to date. Bonavista may also have the finest beach: soft sand with easy entrance to the water. The staff was terrific, and Janet, the cook, was a genuine Bajan with a wonderful demeanor and lots of knowledge. One of the highlights was my morning chats with Mr. Scant, the groundskeeper, a truly beautiful person who would greet me each morning with a big hug, despite me being covered in sweat after my morning jog. This was another great, “classic” Bajan vacation: already planning for next year. As always, Andrew was terrific in setting things up and the local island agent Emma was great: attentive to all our needs. As seamless as it gets!